After booting, the BIOS of the computer reads 512 bytes from the boot devices and, if it detects a two-byte "magic number" at the end of those 512 bytes, loads the data from these 512 bytes as code and runs it. This kind of code is called a "bootloader" (or "boot sector") and we're writing a tiny bit of assembly code to make a virtual machine run our code and display "Hello world" for the fun of it. Bootloaders are also the very first stage of booting an operating system. You might have wondered what happens when you press the "power" button on your computer. Well, without going into too much detail - after getting the hardware ready and launching the initial BIOS code to read the settings and check the system, the BIOS starts looking at the configured potential boot devices for something to execute. It does that by reading the first 512 bytes from the boot devices and checks if the last two of these 512 bytes contain a magic number (0x55AA). If that's what these last two bytes are, the BIOS moves the 512 bytes to the memory address 0x7c00 and treats whatever was at the beginning of the 512 bytes as code, the so-called bootloader. In this article we will write such a piece of code, have it print the text "Hello World!" and then go into an infinite loop. Real bootloaders usually load the actual operating system code into memory, change the CPU into the so-called protected mode and run the actual operating system code. To make our lives a little easier (sic!) and make it all more fun, we will use x86 assembly language for our bootloader. The article will use the GNU assembler to create the binary executable file from our code and the GNU assembler uses the "AT&T syntax" instead of the pretty widely-spread "Intel syntax". I will repeat the example in the Intel syntax at the end of the article. For those of you, who are not familiar with x86 assembly language and/or the GNU assembler, I created this description that explains just enough assembly to get you up to speed for the rest of this article. The assembly code within this article will also be commented, so that you should be able to glance over the code snippets without knowing much about the details of assembly. Okay, so far we know: We need to create a 512 byte binary file that contains 0x55AA at its end. It's also worth mentioning that no matter if you have a 32 or 64 bit x86 processor, at boot time the processor will run in the 16 bit real mode, so our program needs to deal with that. init: # this is the beginning of our binary later. jmp init # jump to "init"
Note You can call your label whatever you wish. The standard would be _start but I chose init to illustrate that you can call it anything, really. Woah, hold on! Our output is already 784 bytes? But we only have 512 bytes for our bootloader! Well, most of the time developers are probably interested in creating an executable file for the operating system they are targeting, i.e. an exe (Windows), elf (Unix) file. These files have a header (read: additional, preceeding bytes) and usually load a few system libraries to access operating system functionality. Our case is different: We want none of that, just our code in binary for the bios to execute upon boot. Usually, the assembler produces an ELF or EXE file that is ready to run but we need one additional step that strips the unwanted additional data in those files. We can use the linker (GNU's linker is called ld) for this step. The linker is normally used to combine the various libraries and the binary executables from other tools such as compilers or assemblers into one final file. In our case we want to produce a "plain binary file", so we will pass --oformat binary to ld when we run it. We also want to specify where our program starts, so we tell the linker to use the starting label (I called it init) in our code as the program's entry point by using the -e init flag. Luckily, we can just fill our binary with a bunch of zeroes and add the magic number as data at the end. Let's start with adding zeroes until our binary file is 510 bytes long (because the last two bytes will be the magic number). We can use the the preprocessor directive .fill from as to do that. The syntax is .fill, count,size,value - it adds count times size bytes with the value value wherever we will write this directive into our assembly code in boot.s. Oh wait... if the magic bytes are 0x55aa, why are we swapping them here? That is because x86 is little endian, so the bytes get swapped in memory. Now if we produce an updated binary file, it is 512 bytes long. You could theoretically write this binary into the first 512 byte on a USB drive, a floppy disk or whatever else your computer is happy booting from, but let's use a simple x86 emulator (it's like a virtual machine) instead. 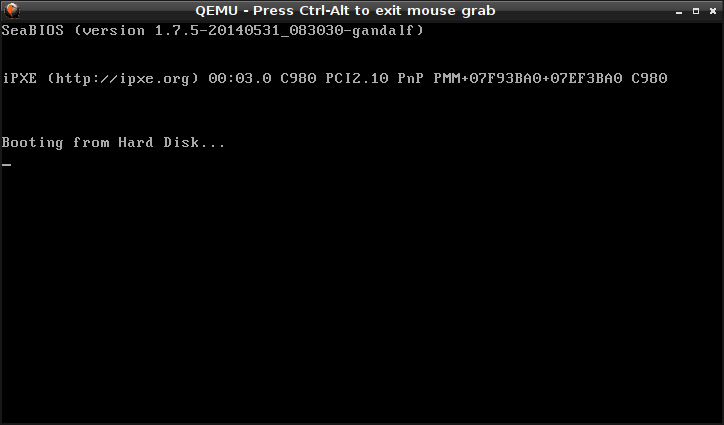 The fact that QEmu stops looking for bootable devices means that our bootloader worked - but it doesn't do anything yet! This new command ljmpw $0xFFFF, $0 jumps to the so-called reset vector. This effectively means re-executing the first instruction after the system boots again without actually rebooting. It's sometimes referred to as a "warm reboot". Okay, let's start with printing a single character. We don't have any operating system or libraries available, so we can't just call printf or one of its friends and be done. Luckily, we have the BIOS still around and reachable, so we can make use of its functions. These functions (along with a bunch of functions that different hardware provides) are available to us via the so-called interrupts. In Ralf Brown's interrupt list we can find the video interrupt 0x10. Now we're loading the necessary value into the ax register, call interrupt 0x10 and halt the execution (using hlt). We can even see that the cursor blinks at the next position, so this function should be easy to use with longer messages, right? To get a full message to display, we will need a way to store this information in our binary. We can do that similar to how we store the magic word at the end of our binary, but we'll use a different directive than .byte as we wanna store a full string. as luckily comes with .ascii and .asciz for strings. The difference between them is that .asciz automatically adds another byte that is set to zero. This will come in handy in a moment, so we chose .asciz for our data. The first line loads the address of the first byte into the register bx (we use the entire register because addresses are 16 bit long). The second line then loads the value that is stored at the address from bx into al, so the first character of the message ends up in al, because bx points to its address. Dang, what does that mean? 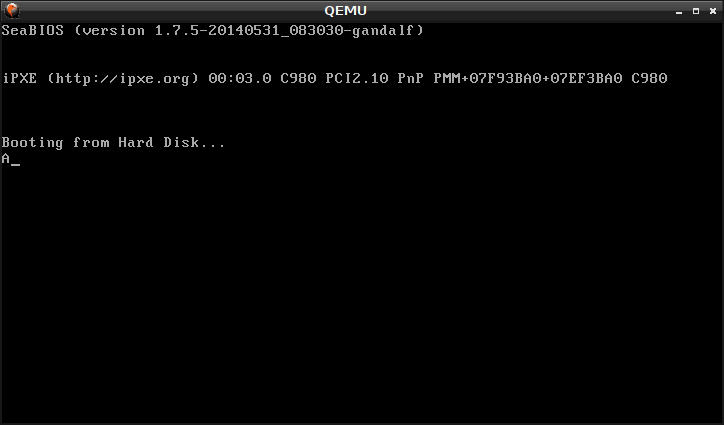 QEmu will now print "H", the first character of our message text. Put the address of the first byte of the string (i.e. msg) into any register except ax (because we use that for the actual printing), say we use cx. What is also useful is the fact that x86 has a special register and a bunch of special instructions to deal with strings. In order to use these instructions, we will load the address of our string (msg) into the special register si which allows us to use the convenient lodsb instruction that loads a byte from the address that si points to into al and increments the address in si at the same time. je done # if al == 0, go to "done"
It prints our message by looping from print_char to jmp print_char until we hit a zero-byte (which is right after the last character of our message) in si. Once we find the zero byte, we jump to done and halt execution. As promised, I will also show you the alternative way of using nasm instead of the GNU assembler. je done   ; if AL == 0, jump to "done"
(Thanks to Reddit user pahefu for pointing out a typo here! 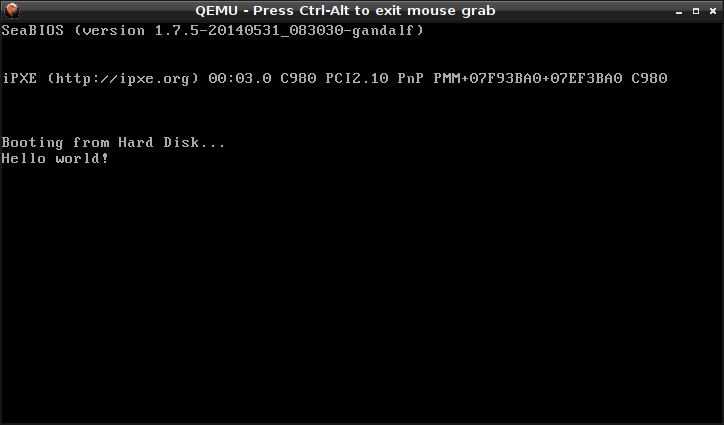 After saving it as boot.asm it can be compiled by running nasm -o boot2.bin boot.asm. Note that the order of arguments for cmp are the opposite of the order that as uses and [org] in nasm and .org in as are not the same thing! nasm does not do the extra step via the ELF file (boot.o), so it won't move our msg around in memory like as and ld did. Yet, if we forget to set the start address of our code to 0x7c00, the address that the binary uses for msg will still be wrong, because nasm assumes a different start address by default. When we explicitly set it to 0x7c00 (where the BIOS loads our code), the addresses will be correctly calculated in the binary and the code works just like the other version does.